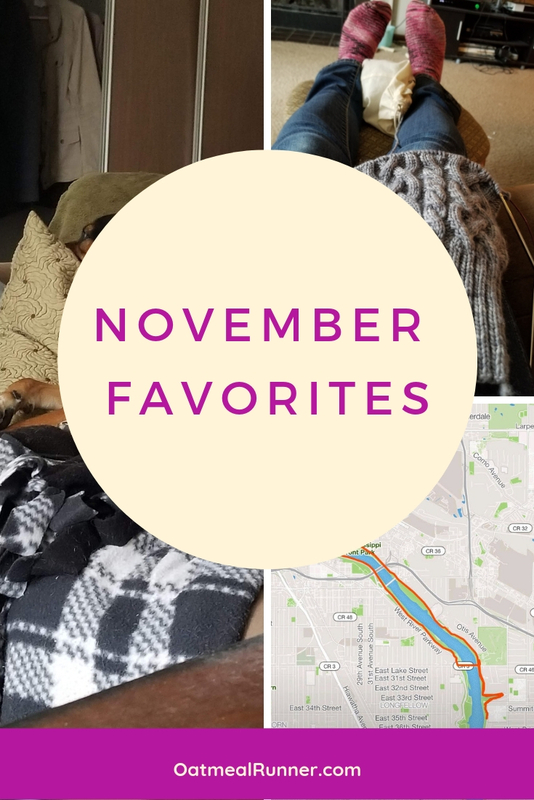 November has come and gone so I have a new batch of favorites to share with you! I’ve been able to spend some more time relaxing this month so most of my favorites have to do with that. But I also have one running related favorite. No, it’s not the weather. No snow has stayed on the ground yet but it’s been chilly and windy so full-on winter is just around the corner. I loved the original tv series of Sabrina the Teenage Witch (with Melissa Joan Hart) and watched every single episode multiple times. I’d never read the comic books but when I first heard about the Netflix series, I knew I had to watch it. And I loved it! It took me a couple of weeks to get through it since I don’t watch too much TV solo but it was such a good show to have on to relax and knit. I’m so excited for the mid-winter special! I get the max amount of vacation time at work (because I’ve been there for over seven years) and it was this month that I realized that I needed to take six days off before Christmas break begins on December 21 or else they wouldn’t roll over. Cue me taking off off a bunch of days, including the entire week of Thanksgiving. And it’s been so nice to not feel as rushed, be able to sleep in and have a much more relaxed day. I’m still keeping a somewhat structured day between workouts and blocking off time to work on this blog. I’ve been slowly dipping my toes into the Hercule Poirot novels over the summer and now I’m determined to make it through all of them! I started out with the audiobook version of The Mysterious Affair at Styles, then read Murder on the Orient Express and now I’m reading The Murder on the Links. If my library had audiobook copies of all the books, I’d go through them much faster (the narrator is amazing) but for now, it looks like I’ll be working through on hard copies. Lately, my long runs have been taken me through the main University of Minnesota campus. It’s a great way to get in extra hills and there’s not as much car traffic either. It’s just quiet and gives me a challenge during my workout. The only downside is there’s a flock of turkeys that are still hanging out there but so far they are keeping to themselves. What have been some of your favorite things in November? Share them in the comments! I am officially halfway through training for the Reindeer Run 10K and it is going awesome! Especially this week with an awesome pace run plus a great yoga session on my rest day. Let’s get into it! Some days, working out is easier than others. Today's workout wasn't the worst but I had to pull back some from my normal Monday. Between a little bit of a cold and recovering from this weekend's workouts, I had to pay attention to my body so i wasn't pushing too hard. Now it's time to refuel with waffles and a bath! 5K pace intervals on the treadmill after work. I switched up the length to 1/2 mile repeats since it's easier switching up the speed less often on the treadmill. And I was a sweaty mess afterwards! Intervals felt great even though I could tell I was pushing it. Kept all my pace intervals between 8:30-8:35 which isn't too bad for trying to figure out where the treadmill speed needed to be for my pace. Nice easy run after work, caught the last bit of sun since I ran right from work! Great cross training day as I get ready for a long week off of work. One more day tomorrow and then I'm off until after Thanksgiving. After being able to take an hour long yoga class last week, I decided to try and little bit longer yoga video on my rest day. And it was just what I needed to keep my mind engaged! Usually, I find myself getting a little bit bored with the shorter (15-20 minute) yoga videos but this felt a lot less rushed and I was able to work on each pose. Plus, it ended with some handstand prep by doing kick ups which was lots of fun! An awesome feeling 10K pace run (which I ran faster than 10K pace....but who's keeping track?)! It was a gorgeous morning for a run and I felt smooth running at these paces. Chilly long run along the river this morning. My handheld sprung a leak so I had to ditch it after the first mile and had wet (then frozen) mittens for the rest of the run. This last week of running, I’m feeling a lot more rested and less worn out than last week. I did have a massage on Sunday which helped a ton, plus I’ve been getting a lot more sleep. I got 9-10 hours of sleep each night over the weekend! Hopefully, being off of work this next week keeps me feeling less worn out because I’ll have even more time for mobility and stretching. Plus, I’m going to be trying for a 5K PR at the Turkey Trot Mike, Vinnie and I are doing with Mike’s family! It won’t be an official chip timed PR since (as far as I know) this race isn’t chip timed) but I’m hoping get a sub-26 5K time. How did your last week go, are you training for any races or dealing with colder weather? Let me know in the comments! This past weekend was a big for marathons so I’m sure there are at least a couple of you who are recovering from tackling 26.2. Today, even though I didn’t run a marathon this last weekend, I wanted to share my top tips for marathon recovery that I learned from my first two marathons. 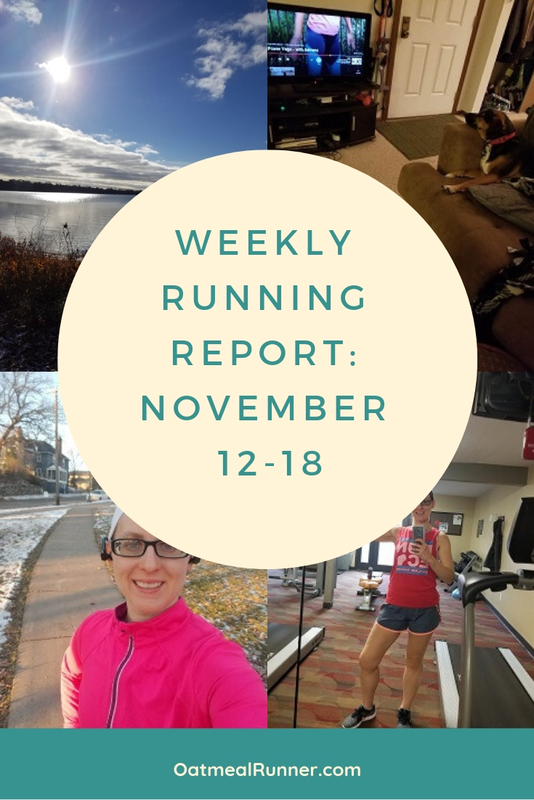 Keep moving after the marathon: my recovery after the Eau Claire Marathon was so much better than Twin Cities and I think a major part is I didn’t just lay (or sit) around the rest of the day after the marathon. I got out for a (very slow) 20 minute walk about five hours post-marathon which I believe really helped my legs feel better. Book a massage: I love my monthly massages but a post-marathon massage really helped my recovery. I had mine within a couple days of the marathon and it was so relaxing and helped loosen up my tight spots that I couldn’t reach with a foam roller. Elevate your legs: for the first day after both Twin Cities and Eau Claire, I kept my legs elevated with pillows whenever I was sitting or laying down. This really helped my legs not feel like they were constantly twitching (which helped me sleep through the night) and just felt more comfortable. Did you ran a marathon this past weekend? Let me know how it went and how your recovery is going in the comments! Want to hear more about my marathon recovery? Check out my posts on recovery after the Twin CIties Marathon and Eau Claire Marathon. Want to try it out for yourself? Here’s how easy is: all you have to do is lay down on the floor, shimmy your hips as close to the wall as possible and walk your feet up the wall until your are ina L-shaped position (depending on your flexibility). Make any adjustments to make this more comfortable with pillows or how you position your arms. I also like to put on a podcast and focus on my breathing during this time. If you have any pets, they might be very interested when you do legs up the wall pose. Vinnie loves it because I’m in the perfect position for unlimited scratches! Have you tried legs up the wall pose?